I had the pleasure of meeting with Roger one fine Friday. We chatted for several hours as he looked over Papoose and commented on what was similar and what was different. I was impressed with the scope of what Roger is doing with Electra. He is basically rebuilding almost the entire boat. 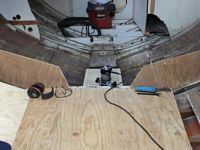 He has replaced the keel bolts, the floors and the frames. After he is done with that, he will replace all the planks below the water line. In the end, he will have replaced everything below the waterline except the deadwood and the ballast. The old boat is just a mold for the new boat he is building. Seems like Electra was not in very good shape when he bought her. You can follow the progress in the pictures below. Electra is being rebuilt to better than new condition while retaining the timeless elegance of her design. All mahogany brightwork and bronze fittings will be retained. Improvements will allow for safety and reliability but not at the expense of compromising Lapworth's graceful style of the L-36. CAD drawings have been made of all replacement parts and eventually engineering drawings will be created for the hull, deck, mast and interior. 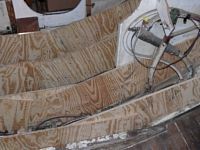 To date, approximately half of the keel bolts, floors, and ribs have been replaced. Replacement bolts are custom CNC machined silicon bronze, floors are solid white oak, and ribs are laminated white oak. A replacement Westerbeke 30B diesel has been torn down and is being rebuilt parallel with efforts to rebuild the hull. Sections of the hull will need to be replanked, faired and refinished. The cockpit will be rebuilt very similar to the original design with improvements to the weather sealing of the lift-up seat hatches. Standing and running rigging will be replaced as well as all electrical systems wiring. New Spartan Marine seacocks will be installed. 1950's style brass Foresti & Suardi navigation lights will be used. Most of the replacement hardware has been purchased and inventoried for future installatonto insure a timely restoration schedule. Eventually, a revised interior will include updates in design and function for both day sailing and racing. Electra should be splashed later this year and will make the coastal waters of Southern California her home. Traveling over the Vincent Thomas bridge in San Pedro, CA to the Moger Yacht Storage yard. 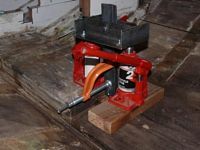 Jig used for pulling keel bolts. These are .500 inch steel bolts which went through the dead wood. Plywood used to reenforce broken ribs in the main cabin prior to hauling and transport. Set-up for fabricating new ribs. New laminated ribs are 13 layers of .125 by 1.38 inch white oak glued with Resorcinol glue. Small clamps on left are used for vertical alignment prior to clamping with large clamps approximately 3 inches on center. 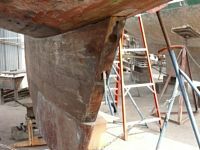 Original keel and deadwood bolts were skewed to follow the taper of the keel and then bent perpendicular at the keelson to allow for straight through holes in the floors. 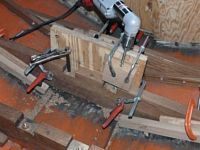 Rather than weaken the new bolts by bending, skewed holes were drilled in the floors using this jig. Floor and ribs are initially clamped to a backing plate to establish position of the floor, then the floor is removed and a drill guide block and alignment rod used to establish alignment of the thru hole on the first side, alignment rod is then removed, floor repositioned, and drilled through. Process is repeated for the other side. 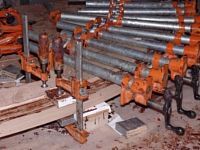 Shown here is the drilling of the second hole where the alignment rod is used to position the floor relative to the first hole. 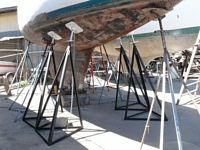 Extra jack stands are placed at critical locations along the hull as frames are removed and replaced. 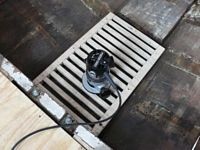 The floor at location 14 was completely rotted and the keelbolt severed several inches below the top nut and washer due leakage from the icebox drain fitting. Only 2.5 inches of keelbolt was exposed above the keelson making removal a difficult task. 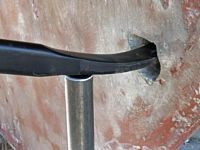 A new approach was devised where a 5/32 inch hole was drilled through the keelbolt and a piece of 5/32 hitch pin (just below the C-clamp) was inserted through the lifting tangs and the keelbolt. C-clamp was used to keep the tangs from spreading apart. The worked very well and little deformation of the hitch pin was noted. Additional upward thrust was required to remove the keelbolt at location 14. Here a 36 inch crowbar supported by a .75 inch ID water pipe fulcrum is used to apply upward pressure in tandem with the pulling tool inside the hull. Given the comprise of keelbolts at location 13 and 14, the deadwood had separated from the underside of the keel stem by .10 - 15 inch. Here a 1/2-13 threaded rod is used to bring the deadwood and stem together. 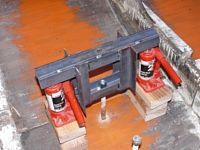 Upper end of the rod has a plywood backer plate resting on the keelson, lower end an oversized washer and coupling nut. Bottom end of rod is counter-held using vise-grips while the coupling nut is tighten. Top portion of the keelson was partially rotted due to fresh water leakage from the icebox. This jig was used to remove the top .38 inch of the keelson to allow a dutchman to be glued in place. 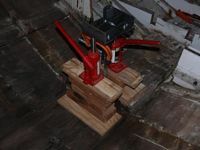 Jig sits on two 1 inch dowels (not visible, but resting on the garboard) and moved fore and aft to help remove defective wood. This set-up worked quite well and only minimal block sanding by hand was required to finish the job. Shop vacuum was used to remove saw dust as worked progressed. Temporary cabin sole of plywood and reinforcement of remaining frames. Work with the router was done while lying on my stomach on the cabin sole. The provided excellent control of the router using both arms. A clean work place really improves work efficiency.